Cell Pack Solutions are very proud to be an authorised distributor for Tadiran Batteries within the UK. This association goes back more than 15 years and started with simple “don’t let me down” conversation with the then UK Sales Director, Peter Meeds, after he gave us our first small credit account. We have now grown into one the major distributors for Tadiran Batteries in the UK stocking the widest range of their cells and with an in-house Battery Pack Assembly Facility, we offer a full Design Service, working very closely with the technical team in Germany. 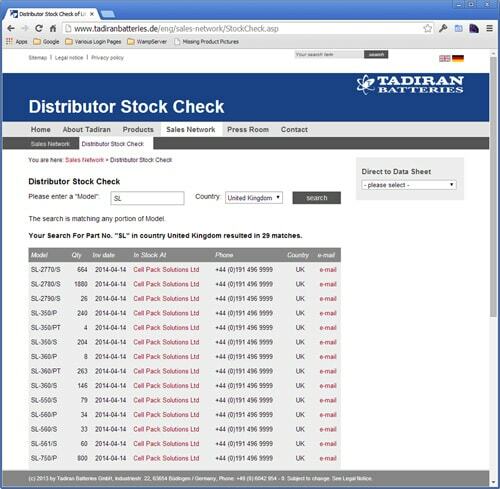 We are one of the few companies in Europe that has taken advantage of the offer by Tadiran Batteries to upload our stock inventory level daily onto their Distributor Stock Check website. Our own Online Shop also lists the current stock levels for all the products we have available. Please note that we may also have other stock allocated to our assembly facility and there could be additional stock available if you Contact Us. You can check the full list of authorised distributors throughout the UK and Europe on Tadiran Batteries’ website: Sales Network of Lithium Batteries. For UK enquiries, we will try our best to win the business on quality of service and stock availability and we happily refer all enquiries from outside UK to check the above website.